Background Bone stress injuries are common in high-level athletics. Aim To describe the demographics, frequency and anatomical location of stress injuries (ie, stress reaction and stress fractures) in athletes at the Rio de Janeiro 2016 Summer Olympic Games. Methods We recorded all sports injuries at the Rio de Janeiro 2016 Summer Olympics reported by the National Olympic Committee (NOC) medical teams and in the polyclinic and medical venues. Imaging was performed through the official IOC clinic within the Olympic Village, using digital X-ray cameras and 3T and 1.5T magnetic resonance (MR) scanners. Images were read centrally and retrospectively by musculoskeletal radiologists with expertise in sports injuries. Results 11 274 athletes (5089 women (45%), 6185 men (55%)) from 207 NOCs participated in the study. 1101 injuries were reported. Imaging revealed 9 stress fractures (36%) and 16 stress reactions (64%) in 18 female and 7 male athletes (median age 25 years, age range 18–32). Stress injuries were mostly in the lower extremities (84%), particularly tibia (44%) and metatarsals (12%), with two in the lumbar spine (8%). Stress injuries were most common in track and field athletes (44%) followed by volleyball players (16%), gymnastics (artistic) (12%) and other type of sports. Conclusions Twenty-five bone stress injuries were reported, more commonly in women, mostly in the lower extremities and most commonly in track and field athletes. Our study demonstrates the importance of early imaging with MRI to detect stress reactions before they can progress to stress fractures. Bone stress injuries are common sports injuries which can disrupt training and competition. They are a major concern for sports medicine physicians. Injury surveillance during the Olympic Games serves an important role in injury prevention in high-level athletes. Despite the availability of publications related to epidemiology and imaging of sports injuries in general (including brief mentions of stress injuries) during recent Olympic Games,1–6 epidemiological data specifically dedicated to bone stress injury in the Olympic Games have not been well established in the literature. Searching PubMed with the phrases ‘stress fracture’, ‘stress injury’, ‘stress reaction’ and ‘Olympic’ reveals no prior publications dedicated to epidemiological data of stress fractures/reaction at the Olympic Games. The oldest relevant paper, published in 1998, described stress fractures in ‘the world class athlete’.7 Conversely, the most recent, published in 2016, was a review article describing tibial stress fractures in athletes.8 Previously published epidemiological descriptive studies from the Summer and Winter Olympics in 2008, 2010 and 2014 did not include dedicated analysis of bone stress injuries.3–5 Bone stress injuries may keep the athletes out of play for a longer period of time than traumatic fractures—an epidemiological study of 2439 elite football players over 10 years showed median length of time being absent from play was 65 days for stress fractures and 30 days for traumatic fractures.9 Moreover, MRI can be used as a tool to detect bone stress injuries.10–12 The aim of our study is to describe the demographics, frequency and anatomical location of stress injuries (ie, stress reaction and stress fractures) in athletes who participated in the Rio de Janeiro 2016 Summer Olympic Games. Paralympic Games were not included our study. This is a retrospective study of imaging data collected at the Rio 2016 Summer Olympic Games from the Radiological Information System (RIS) and Picture Archiving and Communication System (PACS). Medical and imaging services were open for 32 days from the opening of the Olympic Village on 24 July 2016, through the period of the Olympic Games (5–21 August) to the closing of the Olympic Village on 24 August 2016. All National Olympic Committee (NOC) medical teams reported the daily occurrence (or non-occurrence) of injuries on a standardised medical report form. We also retrieved the same information on all athletes treated for injuries in the polyclinic and all other medical venues by the Organising Committee of the Rio de Janeiro 2016 medical staff. We used the athlete accreditation number to control for injuries being treated by both groups. With duplicates, we retained the NOC data. Our study and intent to publish the data were approved by the IOC. We used the athlete accreditation number to query the IOC athlete database for age, gender and nationality of the injured athlete. We treated all information with strict confidence and de-identified our medical database after the Games. Informed consent was waived as all data in our epidemiological study were anonymised and unidentifiable. We obtained approval from the IOC to use anonymised imaging and demographic data for publication. Data were collected, stored and analysed in strict compliance with data protection and athletes’ confidentiality. Diagnostic imaging was performed through the official IOC clinic within the Olympic Village, using digital X-ray cameras: Discovery XR656 Advanced Digital Radiography System (GE Healthcare, Brazil) and 3T Discovery MR750w and 1.5T Optima 450 MRw MR scanners (both GE Healthcare, Brazil). Imaging data were retrospectively collected from the Radiological Information System. Anonymised demographic information was also collected for all athletes diagnosed with bone stress injuries on imaging. These data were stratified according to gender, age, participating country, type of sport and anatomical body part. MRI were obtained using fluid-sensitive fast spin echo sequences such as (T2-weighted and proton density-weighted) with fat suppression in axial, sagittal and coronal planes and T1-weighted in two planes as appropriate for each anatomical location. During the Rio 2016 Summer Olympic Games, 607 MRIs were performed for athletes presenting to IOC clinic Imaging Centre. All of these MRIs were centrally read for the purpose of our study regardless of presenting symptoms. All radiographs were reviewed for the presence of a bone stress injury. Stress fracture diagnosed radiographically by the presence of sclerosis, periosteal reaction/elevation, cortical thickening and/or a fracture line at the site of bone pain in an athlete without frank trauma. Bone stress reaction was defined as an ill-defined area of hyperintensity on fluid-sensitive fast spin echo MRI representing marrow oedema at a symptomatic site with no definite demonstrable fracture on radiography or MRI. We used the Fredericson classification system for medial tibial stress syndrome13 (figure 1) (grade 0=normal; grade 1=periosteal oedema; grade 2=marrow oedema visible on T2-weighted images only; grade 3=marrow oedema visible on both T1-weighted and T2-weighted images; grade 4a=intracortical signal changes in multiple focal areas; grade 4b=linear region of intracortical signal changes). All cases in our study had gradual onset of pain either prior to or during the Olympic Games without a specific traumatic episode as a trigger. Bone marrow oedema on MRI in athletes with a specific recorded episode of trauma that lead to imaging studies were not considered as stress injuries and therefore were excluded from our study. Two board-certified musculoskeletal radiologists centrally and independently reviewed radiographs and MRI, in a retrospective fashion beyond the onsite clinical reporting, for the presence and type of stress injuries, which were classified into stress reaction and stress fracture based on imaging findings. For cases in which there were discrepancies in reading between the two readers, a third board-certified musculoskeletal radiologist acted as an adjudicator and mutual consensus was reached following discussion. Examples of each grade of medial tibial stress syndrome according to the Fredericson classification. (A) Grade 1—isolated periosteal oedema (light blue arrow). (B) Grade 2—marrow oedema (yellow arrows) visible on T2-weighted image only and normal marrow signal on T1-weighted image. (C) Grade 3—marrow oedema visible on both T1-weighted and T2-weighted images (yellow arrows), without cortical disruption or periosteal reaction. (D) Grade 4a—intracortical signal changes in multiple focal areas (yellow arrows), periosteal oedema (light blue arrow) and marrow oedema (pink arrow). (E) Grade 4b—linear hyperintensity (red arrow) and intra-cortical signal changes (yellow arrows). In total, 11 274 athletes (5089 women (45%), 6185 men (55%)) from 207 NOCs participated in the study. NOC and Rio 2016 medical staff reported 1101 injuries. Centralised review of radiological images revealed 9 stress fractures and 16 stress reactions (total 25 stress injuries, accounting for approximately 2% of all injuries), in 18 female and 7 male athletes (median age 25 years, age range 18–32). Both types of stress injuries were more common in female athletes. Age range and median age were similar for both stress fractures and stress reaction (overall age range 18–30 years for stress fractures, 19–32 years for stress reactions, median 25 years for both). Stress injuries were seen in athletes representing countries in North and South America (stress fracture—Puerto Rico one; stress reaction—Brazil two, Canada one), Europe (stress fracture—one from Azerbaijan, Georgia, Portugal, Romania and Ukraine; stress reaction—two from Netherlands and Ukraine, one from Romania), Africa (stress fracture—two from Egypt, one from Cameroon and Ethiopia; stress reaction—two from Cameroon, one from Algeria, South Africa and Tunisia) and the Middle East (stress reaction—one from Bahrain and Saudi Arabia), but interestingly not from any countries in Fareast Asia or Oceania. 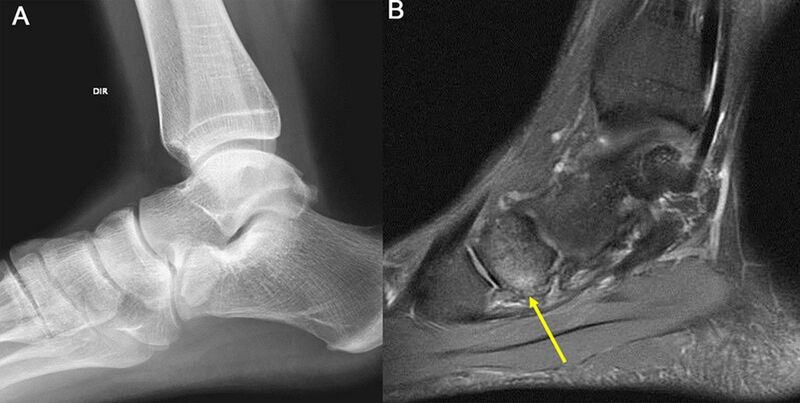 Two athletes were diagnosed with stress fractures by radiography alone without MRI. Three of the stress fractures diagnosed by MRI were radiographically occult. Nine patients had MRI-detected stress reaction/fracture of the tibia (figure 1). Table 1 summarises the distribution of tibial stress injuries according to the Fredericson classification system for medial tibial stress syndrome.13 Twenty-one out of 25 stress injuries were seen in the lower extremities (84%), most commonly in tibia (44%, n=11), followed by metatarsal (12%, n=3, figure 2), fibula (8%, n=2), femoral neck (8%, n=2), navicular bone (4%, n=1, figure 3) and sesamoid bone of the foot (4%, n=1). Two cases were found in the lumbar spine (8%, figure 4), one in the metacarpals (4%) and one in the iliac bone (4%) (table 2). 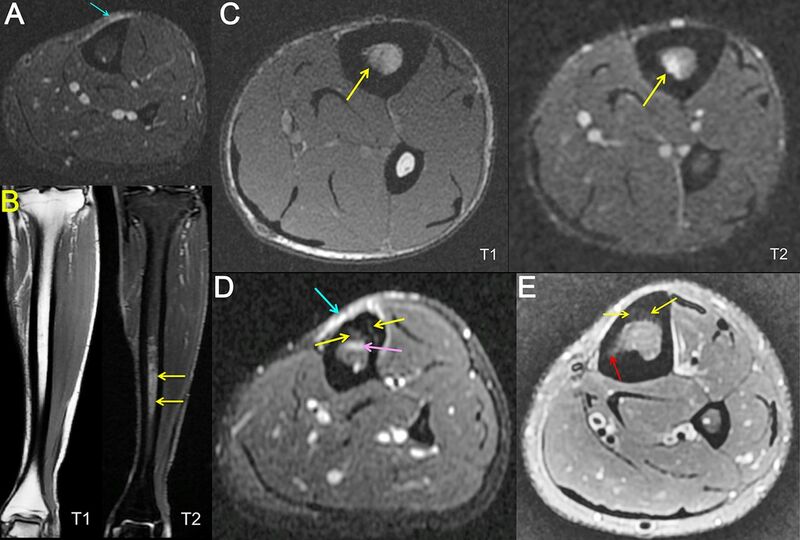 Stress reaction of the base of the third metatarsal in a female sprinter, diagnosed on axial (A) and sagittal (B) fat-suppressed proton density-weighted MRI (arrow). Note the periosteal oedema as well as the bone marrow oedema within the base of the third metatarsal without a discrete fracture line. Tarsal navicular stress reaction in the left foot in a female fencing athlete. This lesion was radiographically occult (A) and detected only on MRI (B, sagittal fat-suppressed proton density-weighted sequence, arrow). 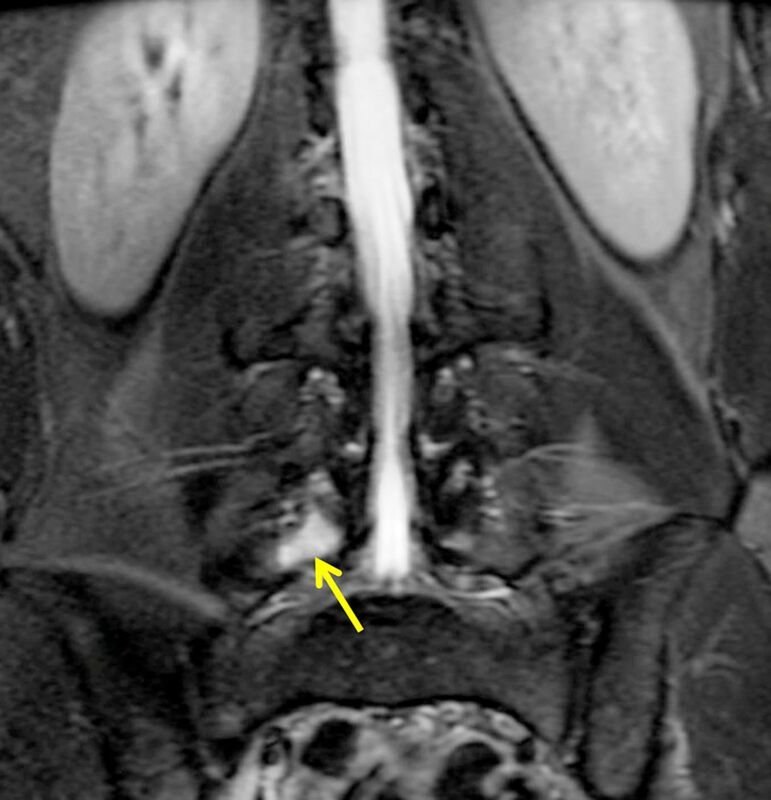 Stress reaction of the right L5 pars interarticularis spreading to the right transverse process (arrow) in a female weightlifter detected on coronal fat-suppressed T2-weighted MRI. Stress injuries were most commonly seen in track and field athletes (44%, n=11) followed by volleyball players (16%, n=4), gymnastics (artistic) (12%, n=3), fencing (8%, n=2) and weightlifting (8%, n=2). One case (4%) each was seen in gymnastics (rhythmic), triathlon and handball (table 3 and 4). Our study included 25 bone stress injuries reported during the Rio de Janeiro 2016 Summer Olympic Games. They occurred more commonly in women, mostly in the lower extremities and most commonly in track and field athletes. According to published data describing injuries during the London 2012 Olympics,2 6 stress fractures were reported (6 of 174 injuries leading to the absence from training or competition by >1 week, approximately 3%).2 Based on unpublished data, there were 40 stress injuries (22 stress reactions, 18 stress fractures; approximately 3% of total 1361 injuries) during the London 2012 Olympics, which is similar to the proportion of total injuries in our study. More female athletes suffered from bone stress injuries than male athletes (18 vs 7) despite there being fewer female athletes than male in the Rio de Janeiro Olympics (5089 women (45%), 6185 men (55%)). Studies have shown risk of bone stress injuries in female athletes can be predicted using an available risk-stratification tool.14 15 In track and field athletes, higher MRI grade of bone stress injuries, lower bone mineral density and skeletal sites of predominant trabecular bone structures were shown to be associated with delayed recovery of bone stress injuries.16 Sports medicine physicians may be aided by the knowledge of these risk factors, as well as nutritional and menstrual factors, in determining the severity of the injury and time to return to sport in female athletes. In terms of global geographical distribution of stress injuries, athletes from North and South America, Africa, Europe and the Middle East were included but interestingly no athletes from Fareast Asia or Oceania (including Australia and New Zealand) had bone stress injuries. The reason is unknown and may be coincidental, but an in-depth epidemiological study to assess for possible multifactorial risks might be worth considering. It should be noted that some of our imaging findings may have already been present prior to the Olympic Games due to overuse and are not necessarily a result of the competition itself. Our study is limited by the fact that we only took into account bone stress injuries diagnosed on the basis of imaging. There could have been athletes who had such injuries but did not undergo imaging, or athletes who did not report their injuries to the polyclinic within the Olympic Village and thus could not be included in our study. Our study is a retrospective data analysis based on central rereading of the images, and thus our interpretation/diagnoses may differ from those established onsite by treating physicians at the Olympic Village Polyclinic. Thus, potential underestimation of stress injuries cannot be entirely excluded. Our study included 25 bone stress injuries reported during the Rio de Janeiro 2016 Summer Olympic Games. Stress reactions can only be diagnosed by MRI and some of the stress fractures were radiographically occult. Our study demonstrates the importance of early imaging with MRI to detect stress reactions before they progress to fractures. Sports physicians should be aware of risk factors for bone stress injuries in high-level athletes, particularly female athletes. Such knowledge may be clinically useful for early detection of bone stress injuries and prevention of unwanted consequences of such injuries resulting in prolonged recovery time and return to sports. Twenty-five bone stress injuries were reported during the Rio de Janeiro 2016 Summer Olympic Games. They occurred more commonly in women, mostly in the lower extremities and most commonly in track and field athletes. Our study demonstrates the importance of early imaging with MRI to detect stress reactions before they progress to fractures. The authors would like to thank IOC members and all staff of Olympic Village imaging centre and sports physicians/radiologists who provided clinical service.
. Imaging depicted sports injuries at Rio de Janeiro 2016 Summer Olympic Games: Retrospective analysis of utilization of diagnostic imaging services. Radiology 2017.
. Stress fracture in the world class athlete: a case study. Med Sci Sports Exerc 1998;30:783–7. Competing interests Ali Guermazi is the President of Boston Imaging Core Lab (BICL), LLC, and a Consultant to Merck Serono, AstraZeneca, Pfizer, GE Healthcare, OrthoTrophix, Sanofi and TissueGene. Frank Roemer and Michel Cremaare shareholders of BICL, LLC. Lars Engebretsen is a consultant to Arthrex and Smith and Nephew. The remaining authors have no conflicts of interest to disclose. Ethics approval The research was approved by IOC as well as ethics committee of South-Eastern Norway Regional Health Authority (#S-07196C). Data sharing statement Unpublished data are not available for sharing. Correction notice This article has been corrected since it was published Online First. One affiliation has been corrected.